The subclass further includes thrusting, hitting and hand-thrown weapons. 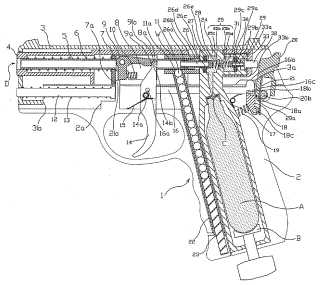 As an exception to the general philosophy, liquid ejecting guns in main group F41B 9/00 may include documents, where the pressurisation of the liquid is achieved with explosive means. Guns for launching the missile with the force of the breath only. The configuration ranges from a simple tube with a mouthpiece at the end, a tube with an appendix offset from the tube's axis carrying the mouthpiece or a tube with a mouthpiece attached at the end of a flexible tube. Launchers using the potiential energy stored in a flexible, tensioned member (except for bows, spring guns), e.g. elastic band or elastic rope (catapults, sling shots, classified in parralel main groups) in sizes ranging from hand-held to multiple meters high. Launchers using gravitational potential energy. Launchers using the kinetic potential energy, in particular centrifugal force. 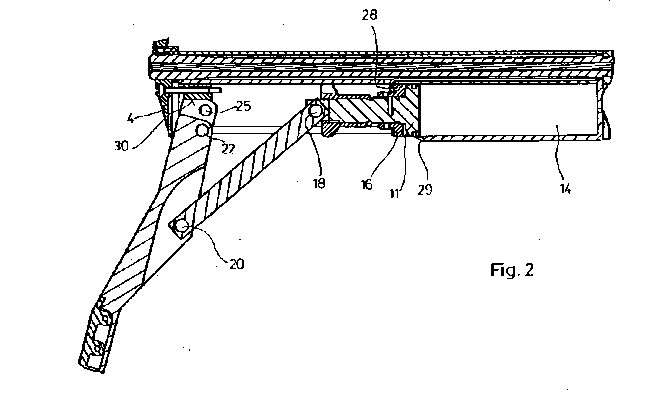 device with a rotary arm carrying a projectile receiving element at one end, the other end either being attached to a heavy weight, the arm having an intermediate turning axle or being fixedly held, the arm being flexible. Further includes functional details of the bow as well as accessories. Crossbows with a particular shape of the bow itself must be double classified in the crossbow group F41B 5/12 and in the respective group for the conventional, standalone bow shape, i.e. F41B 5/0005 for recurve or F41B 5/10 for compound crossbows. Crossbow with the classic unidirectional curvatures geometry bow or completely different (cross-bow unique) geometries, are classified in the crossbow group F41B 5/12 only. It further includes functional details as well as accessories peculiar to crossbows. Includes:- devices on the bow itself and, e.g. 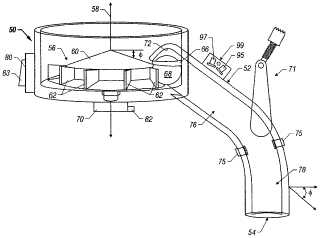 vibration dampers, bowstring silencers, buttons or clickers; and- devices for archery, e.g. arrow pullers, fletching jigs, bowstring releasing devices, bow presses, bow cases. Launchers using dynamic electromagnetic fields for accelerating a missile which is itself magnetic/magnetisable or which is carried by a magnetic/magnetisable sabot. 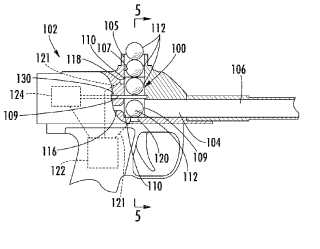 Guns for expelling liquid at high pressure and high velocity, i.e. the liquid is the missile in this main group. As an exception the general philosophy, liquid ejecting guns in this main group may include documents, where the pressurisation of the liquid is achieved with explosive means, e.g. disruptors. This group is not in use. 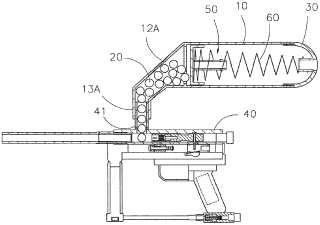 Guns or devices for discharging projectiles through a barrel by conversion of the potential energy stored in a compressed gas into kinetic energy for the propulsion of the projectile. The compressed gas is either available in a pre-compressed form or compressed with mechanical means, i.e. without use of explosive or combustible propellant charge, immediately before or during the launching of each projectile. Every single compressed gas gun will inherently comprise a valve - DO NOT classify them in F41B11/32 if the valve as such is not relevant for the invention. also sometimes referred to as BB guns, however using plastic pellets of 6mm diameter. Softair guns are usually externally shaped like firearms. 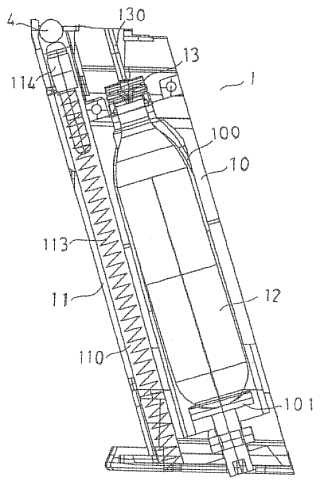 Containers for holding a plurality of missiles to be projected by a compressed gas gun, i.e. magazines. 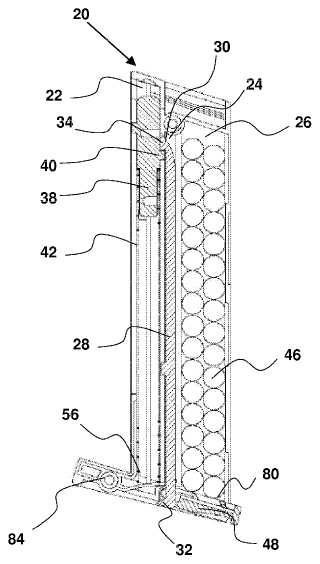 Devices or mechanisms for sequentially bringing such missiles from an external magazine into the gun frame/casing/housing/receiver, i.e. feeding arrangements. 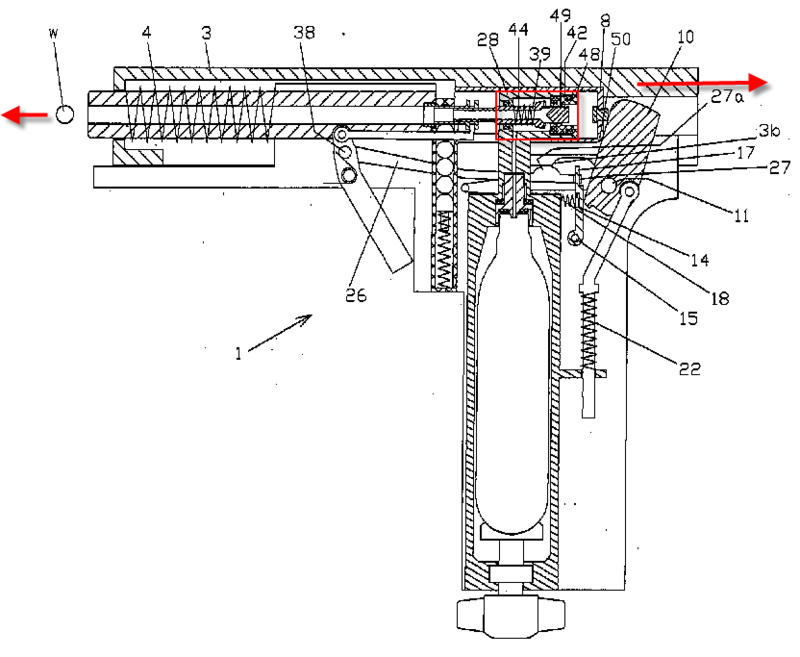 Devices or mechanisms for sequentially bringing such missiles into the position inside the compressed gas gun ready to be projected ("firing" chamber), i.e. loading arrangements. 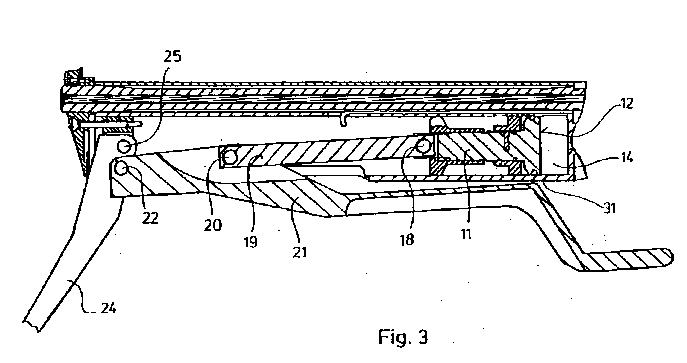 Magazines integrally formed with the gun, i.e. the magazine is not removable. The missiles to be projected by the compressed gas gun are inserted and stored directly in a space/cavity formed in the gun. 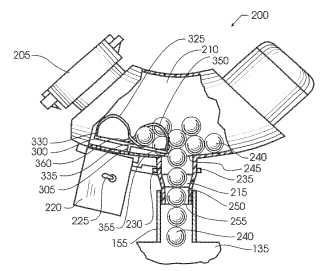 the projectiles are spherical so that there is no need for orienting the projectiles in a specific way for feeding or loading. 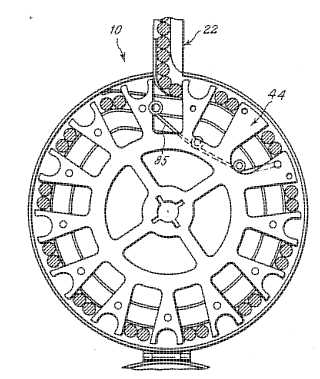 Stationary drum, the projectiles being force fed out of the drum by a spring/motor, the projectiles being arranged around the periphery of the drum. Stationary drum, the projectiles being force fed out of the drum by a spring/motor, the projectiles being arranged in a spiralling fashion. Revolver type drum, the drum rotating incrementally, the rotation being indexed so as to position the projectile to be fired in alignment with the firing chamber. The projectiles are stored in an ordered fashion, i.e. 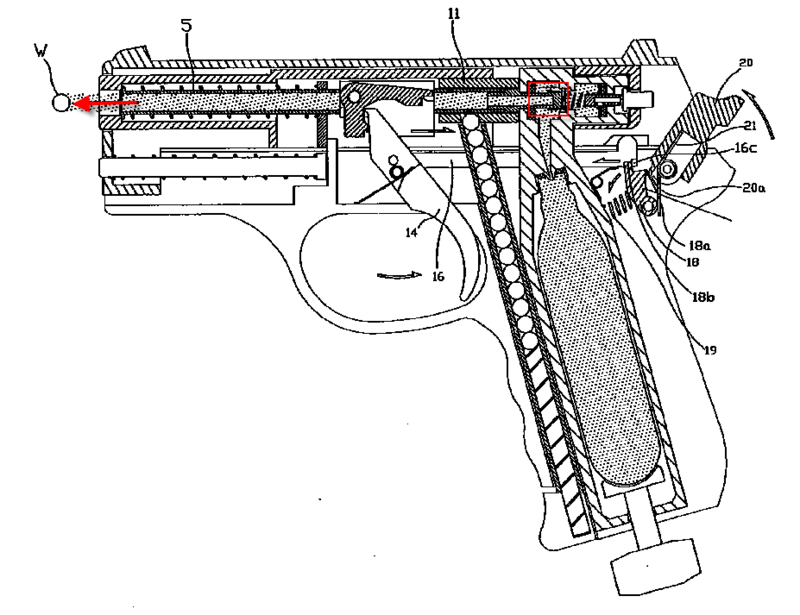 the order in which the projectiles will be discharged is pre-defined, the arrangement of projectile is substantially linear inside the magazine. This arrangement implies a so-called follower, i. e. a spring biased element pushing the stack of projectiles out the magazine. The magazine is removable from the gun, often as a look alike to a firearm magazine. 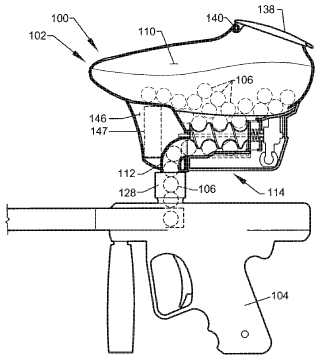 The removable magazine carrying the projectiles also carries an exchangeable or refillable pressurised cartridge such as a CO2 cartridge, usually for soft-air guns. Electric systems for powering of motors for the active force feeding or loading of the projectiles, except for the hoppers having motorised agitation and/or feed assisting means (precedence of F41B 11/53). Electronic systems for the control of active force feeding or loading systems, except for the hoppers having motorised agitation and/or feed assisting means (precedence of F41B 11/53). Residual group including compressed-gas guns with particular means for supplying compressed gas which are not covered in any of the groups F41B 11/62 – F41B 11/684. The airguns classified in group F41B 11/64 (and its subgroups) and in group F41B 11/68 (and its subgroups) are structurally very similar to each other, always comprising an air piston, means for actuating said piston to compress the air, valve arrangements and triggering means. If the compressor stroke is effected at the moment of firing — then F41B 11/64. If the compressor stroke is effected before firing and the gas is stored in a compression chamber or accumulation tank — then F41B 11/68. If the trigger activates the compressor arrangement — then F41B 11/64. 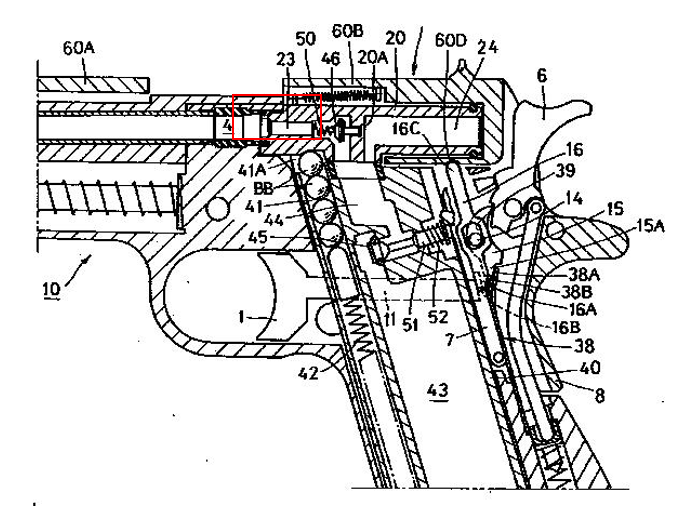 If the trigger activates the opening of the discharge valve — then F41B 11/68. 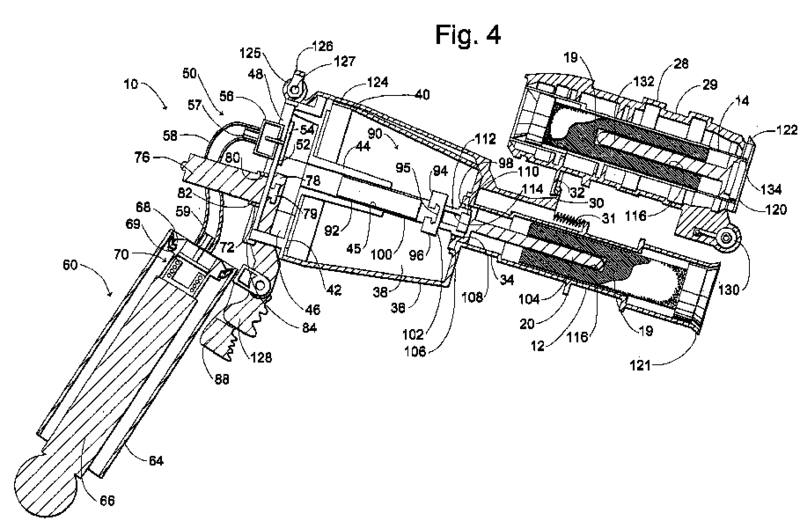 Airguns with manually operated pistons, the piston directly delivering the compressed air to the "firing chamber", i.e. hand-pumps directly feeding compressed air to the "firing chamber". Arrangements wherein the energy for moving the piston in the cylinder is delivered by a spring under tension. Arrangements wherein the longitudinal axis of the spring coincides with the longitudinal axis of the barrel. The spring may be arranged around or behind the barrel. 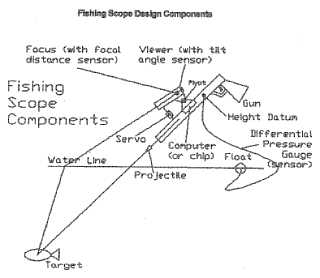 Airguns with spring operated pistons compressing the air during the launch of the projectile will inherently create considerable recoil deteriorating precision. This group covers countermass-type recoil reduction mechanism, wherein, synchronised with the movement the piston, a countermass will be accelerated in the opposite direction to neutralise the reaction force caused by the movement of the piston. Systems with two spring operated pistons with the same mass acting in opposite direction so as to eliminate the recoil force induced by the reaction to the piston acceleration. 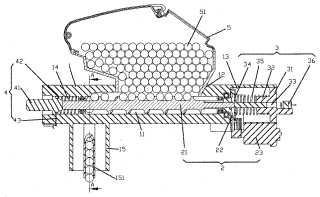 Arrangements for pre-tensioning the spring and holding the piston in the fully spring-loaded position, i.e. cocking. The arrangements do not compress any air, they only accumulate energy in the spring that will, upon trigger actuation, compress air in the cylinder. 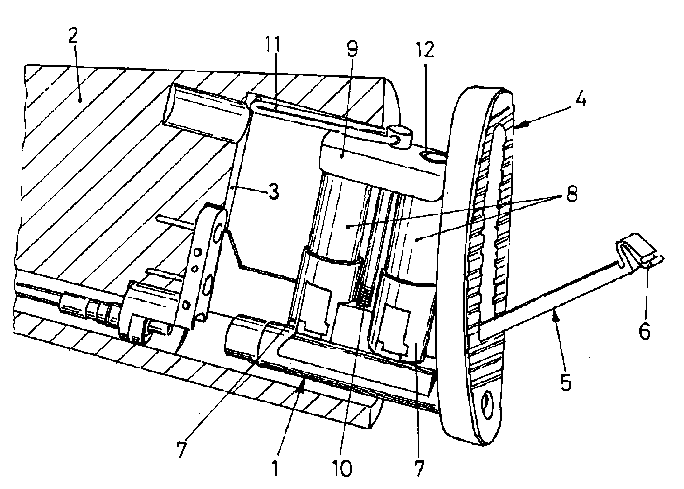 A rocking lever being mechanically linked to the spring-piston arrangement, so as to put the spring under tension and hold the piston in the fully spring-loaded position, i.e. cocking by rocking lever. The breaking of the airgun, i.e. 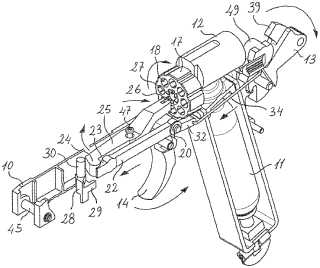 the relative movement of two hinged parts of the airgun, usually the barrel and the receiver, actuates the piston so as to compress the air inside the compressed air storage tank, i.e. the piston itself is the pressure accumulation tank. The two hinged parts of the airgun take over the function of a dedicated rocking lever for actuating the piston. 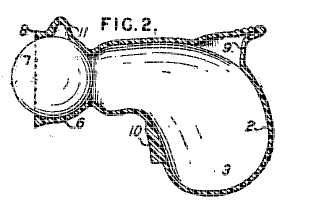 Airguns with a deformable container, e.g. bellows, a bulb or other substantially air-tight part of the airgun, holding a quantity of air, which is pressurised by the squeezing or deformation of the container, so as to decrease the internal volume of the container and urge the air into the "firing chamber" in order to directly launch the projectile. Airguns comprising a compressed air storage chamber (pressure accumulation tank), filled with compressed air before the firing, i.e. 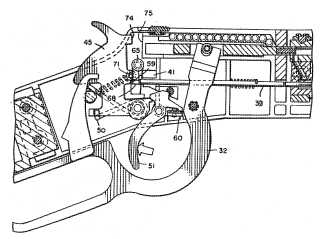 the triggering action of the gun activates a valve or other mechanism to fluidly connect the air storage chamber (pressure accumulation tank) with the "firing chamber", thereby allowing the compressed air to launch the projectile. The exclusion of the group F41B 11/62 implies that some means to pre-compress the air, e.g. 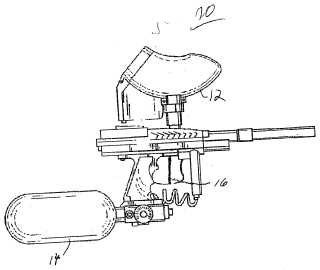 pump or compressor, must be an integral part of the gun. 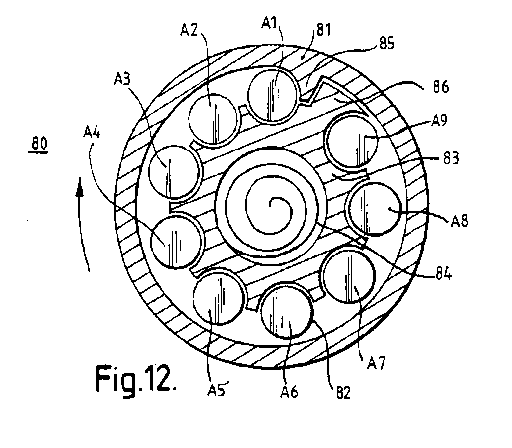 The airguns classified in group in F41B 11/64 (and its subgroups) and in group F41B 11/68 (and its subgroups) are structurally very similar to each other, always comprising an air piston, means for actuating said piston to compress the air, valve arrangements and triggering means. f the compressor stroke is effected before firing and the gas is stored in a compression chamber or accumulation tank — then F41B 11/68. 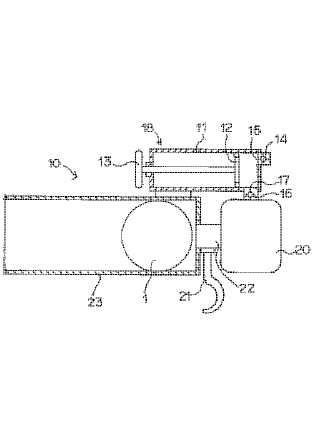 Arrangements for compressing the air in the air storage chamber (pressure accumulation tank), i.e. 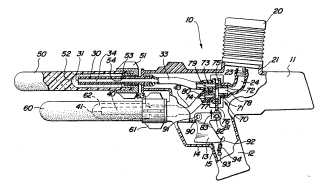 hand-pumps or electrically powered pumps integrated into the gun or permanently attached thereto for compressing atmospheric air into the pressure accumulation tank. 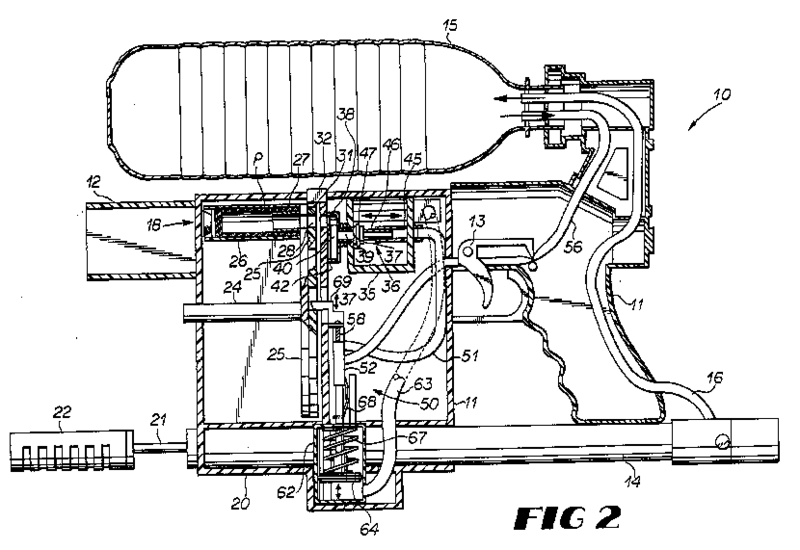 This group further includes airguns with integral or permanently attached pressure accumulation tanks for storing the atmospheric air compressed by a pump or compressor, in particular documents wherein the teaching is specifically aimed at the particular shape/arrangement/configuration/material of the pressure accumulation tank per se. Air guns with integral or permanently attached pressure accumulation tanks for storing the atmospheric air compressed by a pump or compressor. This group contains documents wherein the teaching is specifically aimed at the particular shape/arrangement/configuration/material of the pressure accumulation tank per se. Every single air gun classified in the groups F41B 11/68 and below will inherently comprise a pressure accumulation tank. Classification will be given in this group only, if the tank as such is specially adapted or relevant for the invention. 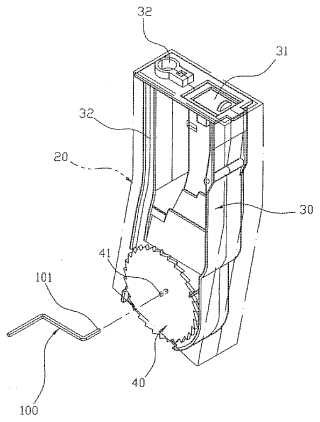 A rocking lever being directly mechanically linked to a piston arrangement, so as to compress the air inside the compressed air storage tank, i.e. the piston itselfis one of the boundaries of the pressure accumulation tank. The breaking of the airgun, i.e. 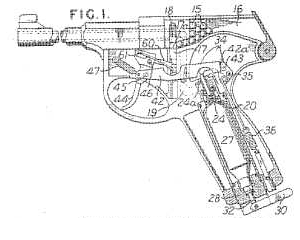 the relative movement of two hinged parts of the airgun, usually the barrel and the receiver, actuates the spring-piston arrangement so as to put the spring under tension and hold the piston in the fully spring-loaded position, i.e. cocking by breakdown mechanism. 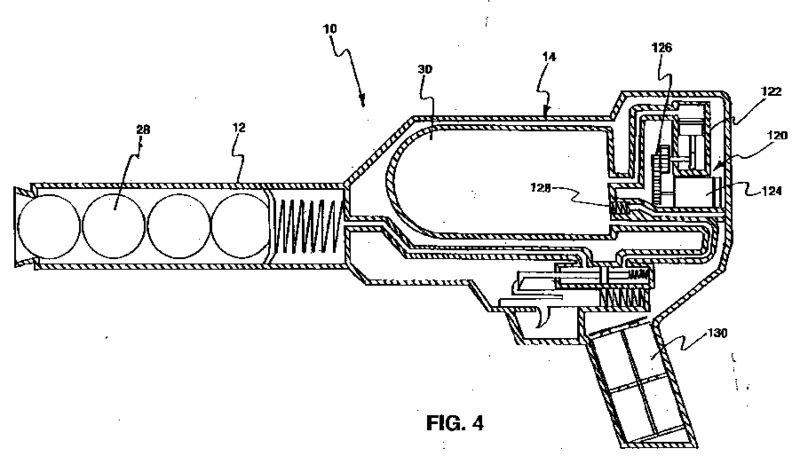 Compressed gas guncomprising a single valve performing the dual function of firing the projectile and feeding or loading the consecutive projectile in a (semi-)automatic compressed gas gun. A valve in a compressed gas gun, the valve being a dedicated valve for performing the function of feeding or loading of the consecutive projectile in a (semi-)automatic compressed gas gun. A valve in a compressed gas gun, the valve being a valve specifically dedicated for performing the function of firing the projectile. A valve in a compressed air gun situated on the pneumatic path between the over-pressurisedcompressed gas source, i.e. accumulation tank, gas cartridge, piston-cylinder, and the firing chamber reducing the pressure to a predefined pressure. 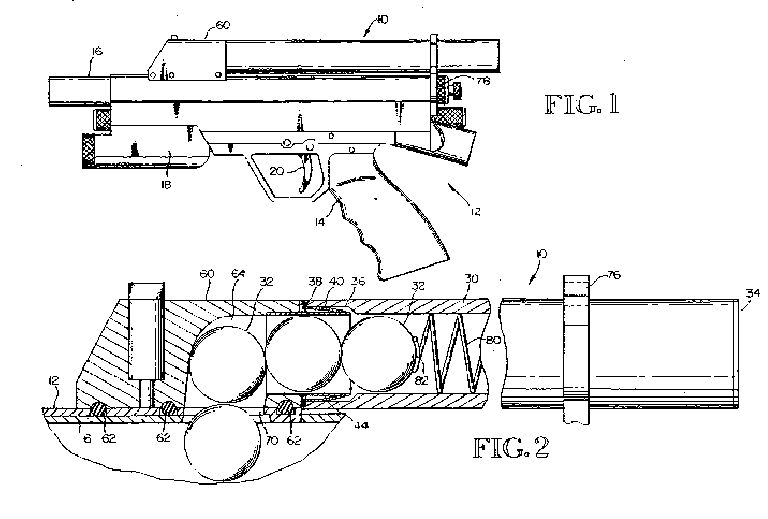 The aim is to achieve pressure regulation for reliably ensuring constant fire power, to reduce the firing power to levels accepted under national laws or to levels corresponding to competition regulations. 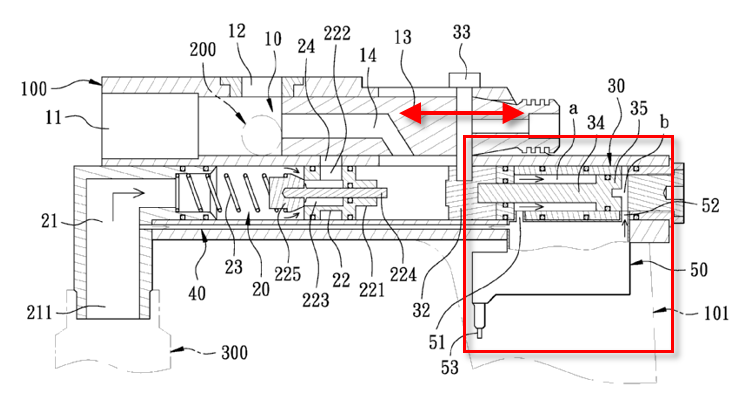 Arrangements of seals in a compressed air gun sealing off any pneumatic component of the compressed gas gun, including in particular the interface between an external gas cartridge or pressure accumulation tank with the internal pneumatic components of the gun. This group contains documents wherein the teaching is specifically aimed at the particular shape, arrangement, configuration or material of the sealing arrangement. This group contains documents wherein the teaching is specifically aimedat the particular shape, arrangement, configuration or material of the sealing arrangement. Every single compressed gas gun will inherently comprise sealing arrangements.Classification will be given in this group only, if the seal as such is specially adapted or relevant for the invention. 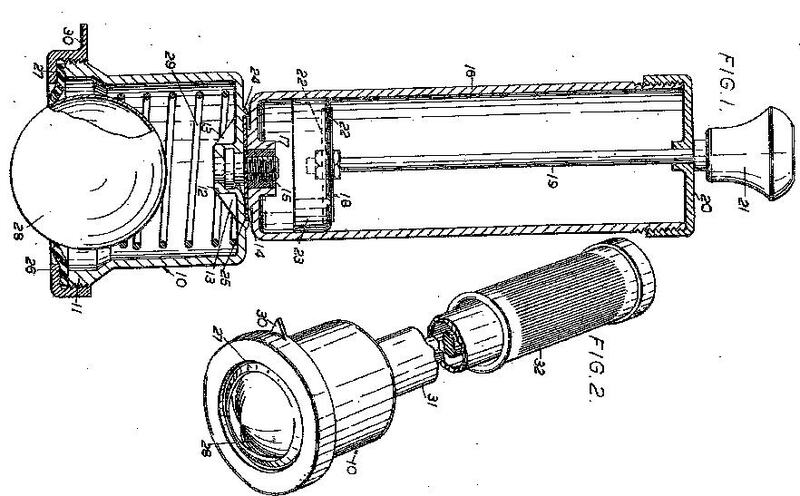 Residual group including compressed-gas guns for particular purposes not covered by F41B 11/81 – F41B 11/89. by spreading the powder directly from a nozzle. 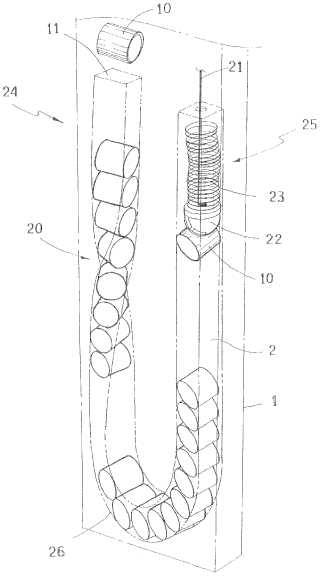 Devices for propelling harpoons or fishing spears with pneumatic pressure, wherein at least part of the shaft of the harpoon is held in the barrel of the compressed gas gun and guided inside the barrel when discharged by the expanding compressed gas. 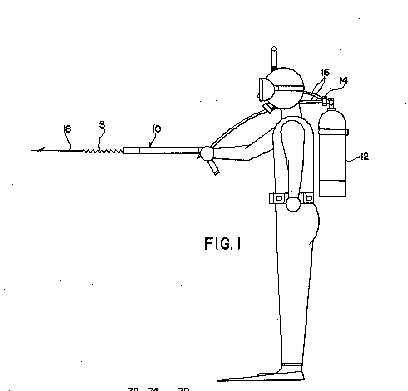 The group includes both, devices for use by divers in submerged condition or by fishers standing on land/ship and propelling the harpoon/spear into the water. Spear gun, harpoon gun, harpoon spear. projectiles used in the veterinary field for delivering medication to an animal from a distance. This group being a pure application related group, any document classified here must also be classified in one of the groups defining the compressed gas gun by its structure or function. Compressed gas guns specifically designed for the intended use in industry, e.g. for cleaning/descaling of ovens, furnaces, kilns or pipes where burning residues or slag is removed by impacting it with projectiles propelled by pneumatic launchers. 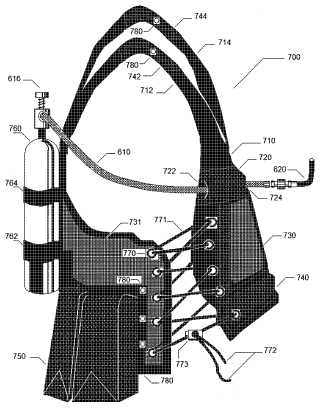 Devices for launching a projectile by air or gas pressure, typically with low energy, with the main purpose of amusement, suitable for use by children without any particular safety precautions. The term "toy gun" is often erroneously used in order to differentiate the air gun from a firearm, see also special rule of classification below. The mere use of the term toy gun in the publication does not imply classification in this group. If the compressed-gas gun is clearly a sports gun, a training or simulation gun it should not be classified in this group. 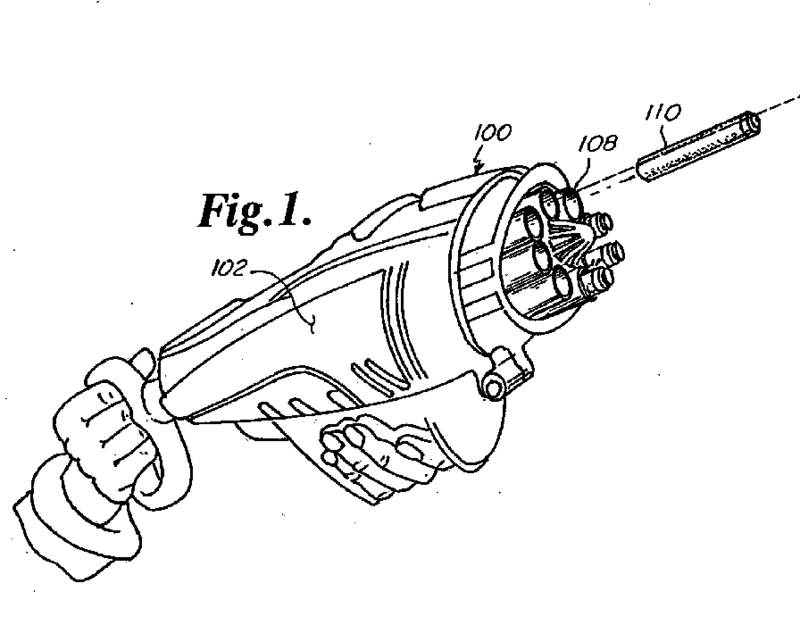 Hand held thrusting and cutting weapons, to be kept in hand during the use, i.e. not intended to be thown.